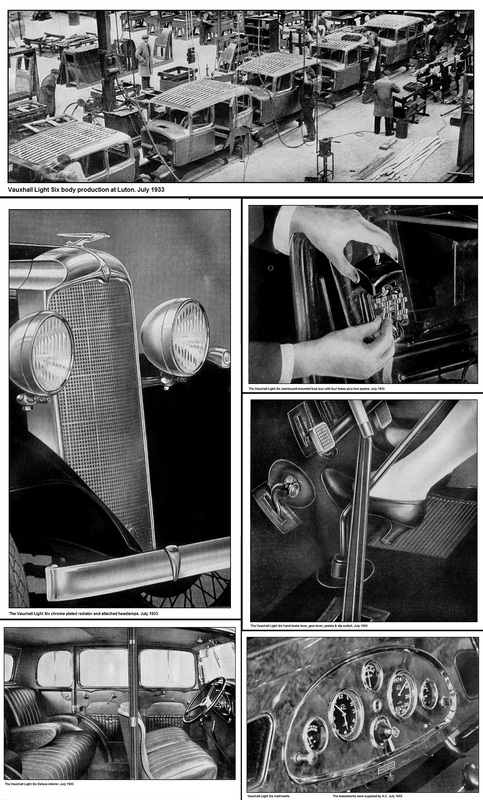 After the take-over by General Motors in 1925 initially there was very little evidence at Vauxhall that anything had changed and, with a few exceptions, not very much did change. Vauxhall Motors continued to produce relatively expensive, high quality motor cars and was easily outsold by a factor of 5 to 1 compared to its nearest, and smallest, volume manufacturer. This was not the plan that General Motors had in mind when they purchased the Company and it would only be a matter of time before significant changes became evident. The first tangible fruits of the takeover by General Motors came with the launch of the Vauxhall Cadet in 1930, available in 17hp form in Britain & additionally a 26hp version for export markets. Although a dramatic downward move into a more popular sector of the market for Vauxhall, since the depression the British market for large vehicles above the 14hp threshold had contracted dramatically and was a trend that was completely misjudged by General Motors management in the USA. GM President Alfred P Sloan was the main culprit, he wrongly & persistently believed that Europeans motorists would prefer to own larger and more powerful cars given the chance to buy them at competitive prices. Thus, despite being keenly priced and with a full specification including synchromesh gears on the later cars, the Cadet was not the sales success GM had hoped for, especially considering the high investment costs incurred in new plant & machinery for true volume production. Fortunately, Vauxhalls Managing Director Charles Bartlett convinced the GM Senior Management that with impending British Parliamentary legislation for compulsory driving tests scheduled for introduction in 1934 the car Vauxhall needed was a smaller 12hp & 14hp model which retained the 6-cylinder engine, for flexibility & therefore fewer gearchanges, to sell at around £200 or less. So, the way was paved for the launch of the Light Six which was announced to the press in May 1933 and went on public sale the following month. Driving licence legislation combined with the vagaries of the British vehicle taxation system had combined in the post-depression car market to give rise to a breed of cars nicknamed “the pint size six”. This effectively meant, with exception of Vauxhall, if gear changing without synchromesh was a bind then build a 6-cylinder car with low gearing that virtually did away with it and at the same time keep the purchase price as close to a 4-cylinder model, with an engine small enough to qualify for the lowest possible rate of vehicle excise duty. British manufacturers such as Triumph & Wolseley followed the cynical route of adding 2 extra cylinders to their already primitive 4-cylinder engines and tried to upscale their 8hp models, the 1931 Austin 12/6 was a disaster and to add insult to injury it was classed as a 14hp vehicle! Before long Morris, Singer, Standard, Crossley and even the redoubtable Lanchester had followed similar paths. Vauxhall were not in the same position; unlike the main British volume manufacturers they did not have a small 8 or 10hp car to upscale. What they did have, in the Cadet, was a larger car they could downscale and furthermore the Cadet 6-cylinder engine was unusually well designed, carefully built and very reliable. Vauxhall began work on The Light Six programme in the latter part of 1931, this programme also included a further £50,000 modernisation of the Luton factory which GM had signed off based on the success of Bedford Commercial vehicle sales but Vauxhalls British management were confident their planned new car would prove to be a success. The design of The Light Six was heavily based on the Vauxhall VY / VX Cadet, both mechanically and in body styling. This was because the Cadet had proven to be reliable and the factory built Saloon was still an attractive looking car, it also meant that much of the tooling costs associated with the production of the Cadet could continue to be amortized with the new model therefore enabling Vauxhall to meet their target selling price and still make a profit. During development, as was usual with Vauxhall, the prototypes were fitted with plain bonnets and radiators with no trademark flutes to give away the models identity, testing mainly at night the experimental cars would cover up to 300 miles before returning to the factory the following morning. The Luton designed smooth and flexible 6-cylinder 2048cc 17hp Cadet VY 4 bearing crankshaft engine was modified for the Light Six by lengthening the stroke to a common 100mm and then, by using a smaller 57mm or 61.5mm bore, to give two engine sizes – 1530cc for the 12hp ASY & 1781cc for the 14hp ASX. As before the engine was pressure lubricated, used BHB aluminium split skirt pistons and ran a common 5.5:1 compression ratio. 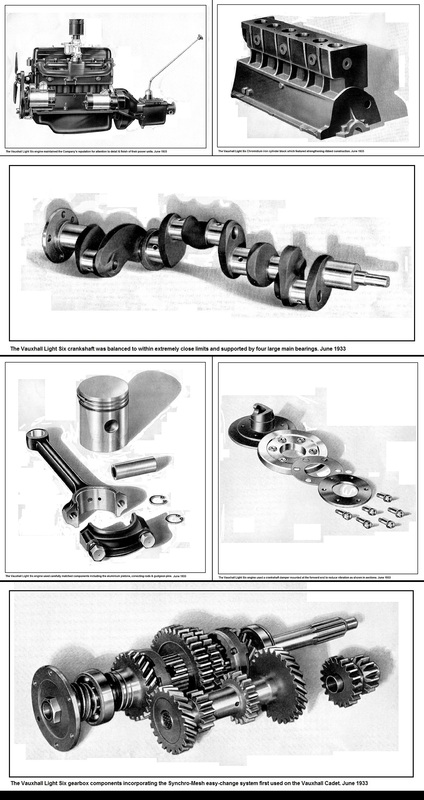 Camshaft drive for the overhead valves was by Duplex roller chain with drive taken via a crankshaft driven sprocket. With a new Zenith, down-draught, carburettor the 1530cc engine produced a healthy 36bhp @ 4000rpm, the 1731cc produced 43bhp @ 3500rpm, with power transmitted via a single plate clutch to a 4-speed gearbox, with “silent third” & synchromesh on 3rd & 4th, that was carried over from the Vauxhall Cadet virtually unchanged. A tubular propeller shaft with 2 metal Hardy-Spicer universal joints and a rubber mounted semi-floating spiral bevel rear axle completed the drivetrain. A final drive ratio of 4.77:1 meant that at 60mph either engine would be turning over at 3700rpm. Vibration was kept to minimum by a crankshaft vibration damper and insulating the engine completely from the chassis frame with rubber mountings. Ignition was by a 12volt Lucas coil & distributor with automatic timing advance and the whole electrical system for the car was protected by four separate fuses instead of the normal single item with the fuse box, including two spares, mounted on the dashboard. The sturdy Vauxhall Cadet chassis design was reinforced with six cross members and shortened to give a 6ins reduction in wheelbase and a 6.5ins reduction in the overall length and a 4.5ins reduction in width. 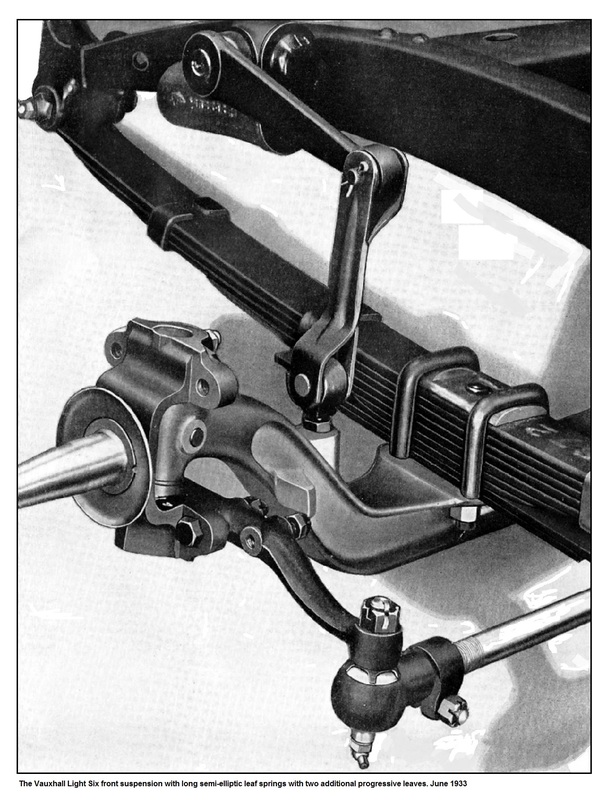 Suspension was by 33ins long semi-elliptic leaf springs at the front with 2 additional “progressive” leaves to suit a wide variety of road conditions, at the rear the leaf springs were unusually long at 50ins, Vauxhall designed & manufactured hydraulic shock absorbers were fitted all round. Steering was by an adjustable worm & sector system with the box mounted in frame to give a good, 34ft, turning circle. At the time, Morris & Singer were the only mass produced British cars with hydraulic brakes but, despite a very upmarket lineage, Vauxhall cars were not renowned for their braking prowess and The Light Six did nothing to enhance this reputation, using a cable operated system which Vauxhall optimistically called a “semi-servo, internal expanding inter-connected” system with both pedal & lever working on all four wheels. The standard wheels were 2.75” x 17” with 4.75” x 17” tyres. The Vauxhall Light Six body design was heavily based on the previous VY Cadet using as many common panels & components as possible to reduce any incremental costs and was of composite construction. It is worth noting that, within the Vauxhall organisation, one of the first advantages of the General Motors takeover was in cost control & financial management, this meant by the early 1930s Vauxhall were better in this respect than any other British car manufacturer at the time. The Light Six retained the traditional Vauxhall bonnet flutes and, with the factory saloon body, had a quintessentially British appearance, so much so it almost bordered on the generic. However, there were some progressive features; The chrome plated radiator, with dull chrome stone guard, was slanted back at a shallow angle and the radiator cap was consigned to under the bonnet. Front headlights were now attached to either side of the radiator shell instead of using the Cadet type light bar and a floor mounted dip switch was fitted. Triplex toughened plate glass was fitted all round and on Deluxe models the patented General Motors “no draught ventilation system” for front & rear passengers which sounded a lot more impressive than it was. Wipers were electric with one as standard and two for Deluxe models. Production of the Vauxhall Light Six began at Luton in May 1933 and was announced to the motoring press in the second week of June. On 14 June 1933 at the Vauxhall Dealer launch for the Light Six there were 250 cars ready to be driven away by dealership staff, an unprecedented event at the time, and it did not take long for the customer orders to come flooding through. Vauxhall were now well on their way to becoming what General Motors had envisaged since 1925 – a true “mass” car manufacturer. The Light Six 12hp Standard Saloon was offered at £195.00 and meant Vauxhall could use this to advertise a 12hp car for under £200, and it is worth noting that the Vauxhall brand at the time still had an upmarket cache associated with upmarket cars and was a significant sales advantage. The Deluxe 12hp could be had for £215.00 and unusually the 14hp could be had for the same price with the same Deluxe specification. Unsurprisingly, the biggest seller was the 14hp model which eventually outsold both 12hp versions by a factor of 10 to 1, by the end of 1933 40% of all 14hp cars sold in Britain were Vauxhall Light Six models. All models came with leather upholstery, comprehensive instruments in a real polished wood dashboard and Triplex Safety glass for all windows, the Deluxe added a sunroof, no draught ventilation, an additional screen wiper and a rear seat folding centre armrest. Offered from the start of 1934, The Light Six Coupe was listed as a regular production model even though the body was made by Grosvenor and whilst it was very attractive looking and was keenly priced at £230 it was not a big seller. As before the Light Six was also produced as a chassis only for a raft of Vauxhall approved bespoke coachbuilders to re-body in a multitude of variations – a Roadster or Tourer by Duple, four different Sports 4 Seaters by Duple, Holbrook, Offord and Wittingham & Mitchel, a Foursome Drophead by Tickford, a Sports Coupe by Grose, a Sports Saloon by Holbrook, a “Doctors” Drophead with Dickey seat by Cross & Ellis or Duple and there were more but the big attraction to buyers was they could all be had for less than £300. The Vauxhall Light Six was also the basis for the first Bedford car derived van range, available in 8cwt or 10cwt with 12hp (ASYC) or 14hp (ASXC) engines. The Vauxhall Light Six was everything the competition wasn’t – it offered buyers a car with reasonable gearing, lively acceleration, a smooth, quiet & reliable engine, high quality body finish, plenty of passenger space in a luxury interior, a prestigious badge and all for an unmatched purchase price. Top speed was 65mph for the 12 and 70mph for the 14hp both were achieved without undue engine stress. The 14hp could accelerate from 0 to 50mph in 21.4 seconds compared to 43 seconds for the Austin 12/6, a car which Vauxhall outsold 2 to 1, the Light Six totals were: 1933 = 8223 & 1934 = 15071. Standard had already dropped their two, unsuccessful, small 6-cylinder models by the time the Vauxhall was launched after only one year in production, Morris had their Cowley-Six but this was taxed as a 15hp model and The Rootes Group had a large gap in their range between the £265 Humber 12 with a dated 4-cylinder engine and the unsaleable Hillman 16 & 20/70. Vauxhall Light Six production ended in August 1934 after a further 5-acre expansion of the Luton factory to cope with ever increasing demand. The two Bedford van versions continued in production until mid-1939 with no change to specification or body updates. As before the Light Six was also produced as a chassis only for a raft of bespoke coachbuilders to re-body in a multitude of variations.